Here is the transcript and video of my ABC TVextended intrerview on LATELINE regarding the recent Greek ‘rescue’ plan. Any comments? ALI MOORE, PRESENTER: Well just a short time ago I spoke to Yanis Varoufakis, an economist at Athens University. Yanis Varoufakis many thanks for talking to Lateline tonight. YANIS VAROUFAKIS, ECONOMIST, ATHENS UNIVERSITY: Thank you. ALI MOORE: Another rescue package for Greece, this one includes the private sector, interest rates on its loans have been cut and it’s been given double the time to pay back those loans, is this it, is this going to fix Greece’s problems? YANIS VAROUFAKIS: No it won’t because Greece’s problems are not Greece’s any more. Had this package been implemented about a year a year and a half ago, perhaps it would have done the trick. But it’s a year and a half too late, the horses have bolted and now we are reconfiguring new locks for the gates. It’s a crisis that has spread well without the limits of Greece. It has, as of course you all know, moved to Ireland and from there south to Portugal; recently it has contaminated Italy and Spain. Currently it’s spreading its wings over Belgium, the French banks and so on. So trying to deal with a Greek problem, as if this is a problem, is effectively seriously to misunderstand the very structure of the crisis. ALI MOORE: At the same time though, this is 150 billion euro, it’s a sort of reshuffling, if you like, of the debt repayment, it has the private sector involved, as I said, is this not going to make it a bit easier for Greece to start repaying its debts without killing the economy? YANIS VAROUFAKIS: Absolutely. But the problem is that Greece cannot survive if the Euro system collapses all around it. So, this is precisely what I said earlier, that had this package been implemented a year and a half ago when the problem was well contained in Greece, then perhaps that would have been the solution, or at least we would have given Europe a very long period of time during which to fix the architecture of the Eurosystem. But given that the crisis now is well without the limits of Greece there’s not much sense in allowing Greece more leeway for repaying its debts if the Euro, as a currency, as a common currency area is on the brink of catastrophe. If Italy and Spain explode, and there is nothing in this package for Italy and Spain, if Ireland buckles under and demands too a restructure of its debts similar to the restructuring that was granted Greece yesterday, there’s nothing in this package to help. And the moment that these developments happen, and I think they will within the next two or three months, then there will be another summit and another long debate about how the problem will be fixed. And, you know, time waits for no-one and a general disintegration of the Euro area would do no-one any good and, of course, it will do Greece no good. ALI MOORE: That said though of course, there was a real fear that with this package and with Greece’s private lenders having to take a hair cut that there’d be contagion, that we’d see other Eurozone borrowers like Spain and Italy, would face sharply higher rates; but in fact in the short period since this package has been announced that hasn’t happened has it? Why is the market feeling more confident then, if the situation is as dire as you paint it? YANIS VAROUFAKIS: I shall suggest that you look back to the previous 18 months of summit after summit after summit and plan and package after plan and package that has been announced. Every time the summit of the European leaders announces a new deal, a new bailout, a new stability package, the market’s nerves steady for a couple of weeks and then when everybody realises that this suggested solution is simply part of the problem, then the market reacting negatively again. I think we’re seeing exactly the same pattern being repeated here. Everybody now in the market place expects and bets, that everybody else will expect that somebody will be optimistic having heard the new, quite radical, package for Greece yesterday, and for the next few days they are taking bets that things will improve. But for the next two or three days, given that the fundamentals have not been addressed we’re going to have the same old pattern of deterioration, of editorials being written that the problem has not been fixed, that the can has been kicked up, not down the road anymore. We’re kicking it up the road and with every kick it’s getting heavier, and in two or three months time you and I might be having exactly the same conversation. ALI MOORE: And indeed, with this package, is it effectively a restructuring that amounts to a default by Greece because those private lenders are going to end up taking a haircut no matter which way they slice it? YANIS VAROUFAKIS: Absolutely. Look, Europe has been in denial now for a year and a half about the fact that Greece is bankrupt. So they’ve been throwing good money after bad to prevent a formal acknowledgement of the bankruptcy of Greece, of the default of Greece. Well now they have given up on that. They have tried to do it in such a way as to present it in a kind of an orderly way, they’re talking of a haircut of around 20-21 per cent, I think that is highly inadequate. Very soon we’re going to be talking about 30, 45, 50 perhaps 60 and 70 per cent haircut. This is how Europe works, it dithers, it delays, it makes cowardly small steps towards the truth and at some point that which it has admonished as impossible it embraces as inevitable. This is typical European way of delaying decision making. The question is whether Europe has run out of time and whether the Euro is going to collapse before the European leaders face up to reality. ALI MOORE: Well indeed, if Greece is bankrupt as you say, if the system itself, if there is a systemic problem with the system as severe as you say, even if Europe woke up today and acknowledged all of this, what could be done? YANIS VAROUFAKIS: I think Europe is a quite rich common currency area, it’s got very deep pockets. And it still has time, and the resources, to deal with the task in hand. Which should be, ought to be, it is not at the moment, the redesign of the architecture of the Eurosystem. There is still time to do it. At some point the point of no return will have been exceeded. I don’t think we’re there yet, but we’re not too far off and the longer our leaders pretend that this is a debt crisis for one or two countries, the longer that they pretend that there is problem with the banking system and the banking system in reality of the Eurozone is bankrupt, or quasi-bankrupt, the closer we are coming to this point of no return. ALI MOORE: But how do you redesign the system and at the same time resolve that. I mean if you look at a map of the various interrelated debt in the countries in the Eurozone, it’s extraordinary, everyone owes everyone else; how do you redesign the system and resolve those deep seated financial problems? YANIS VAROUFAKIS: Very simply, within a few days. Let me outline three steps that we could take in Europe and solve the problem very, very quickly. The first thing we need to do is unify the banking sector. It is preposterous to have European banks, global banks, that are subject to supervision by member states that don’t have their own currencies. It’s preposterous to have France responsible for the French banks, it’s like having Tasmania responsible for the banks that operate in Tasmania or having Wall Street supervised and recapitalised in times of crisis by the state of New York. You can imagine what catastrophe would befall Australia or the United States if that happened. So, the first thing we could do is unify the banking system, supervision and recapitalisation. The second thing we need to do is we need a common bond. Something like the US Treasury Bills, something like the Australian Government Bond, Federal Government Bonds; Eurobonds in other words. Eurobonds would allow us to unify part of the debt of each member state and therefore to restructure it in its entirety and make it manageable. And the third thing we need is an investment policy which is European wide. Something like a Marshall Plan, not for Greece, that they agreed to yesterday, but it is ridiculous to have a Marshall Plan of Greece which is unfunded, which means effectively that monies will be taken out of Ireland, restructure of funds for Ireland and Portugal and Italy, to be redirected and reach out towards Greece. If you have a Eurobond, at the European level, you could co-finance a Marshal Plan for the whole of Europe using the European Investment Bank, which is twice the size of the World Bank, and thus create a growth drive, spurt, that drives the whole of the Eurozone out of the mire of the present crisis. Those three steps could be implemented in a week. And our leaders know it but there are political reasons why they do not implement it. ALI MOORE: Well indeed you make it sound so simple, we are out of time. But I have to ask, if you were a betting man, would you bet this will happen, or do you truly believe the system is that close to collapse? YANIS VAROUFAKIS: There is a fundamental difference between the bet that I would place as a rational agent and the bet I would place as a sentimental agent. My sentimental bet is that it will work, because I can’t even imagine what kind of postmodern 1930s we’re going to end up with in Europe if the Eurosystem breaks up. ALI MOORE: Well Yanis Varoufakis, if only it was all so simple to resolve. Thank you so much for joining us tonight from Athens. The question is not if Greece can be rescued without a redesigned eurozone. The question is if the eurozone can be preserved despite a fix on the Greek problem. Check the Italian/Spanish spreads that are again on the rise after a quick dip after the greek “solution”…. so my prediction unless something is changed fundamentally in europe within the next 5 years the euro will be dead. The EFSF has been given more flexibility but not a larger size. In fact, it is built on the assumption that it will source half its funds by issuing debt backed by AAA-rated Eurozone countries. Sarkozy has foolishly made the presidential election campaing revolve around who as President would be most likely to preserve the AAA rating. The Socialists have jumped on the bandwagon. And then Martine Aubry made the mistake of saying something to the effect that the worst thing that could happen to her would be for the markets to attack France right after taking office (that statement was meant to show her resolve to adhere to fiscal austerity in order to protect the AAA). And then S&P came out and said that the AAA wouldn’t be maintained without a laundry list of “reforms”. With Spain and Italy under attack, it’s basically up to France and Germany to guarantee the EFSF bond issues that are intended to make up over half of the EFSF’s resources. So France doesn’t need to be insolvent – all it needs is to lose the mythical AAA and it’s game over for the EFSF since it’s left with Germany alone guaranteering its bonds. Last autumn Christine Lagarde laughably said that the markets don’t understand the Eurozone. I think the problem is that the Euro policy establishment doesn’t understand the markets. And I can forgive politicians for that, but not central bankers and economists. you of course know, that the broader public in Germany has a pretty negative opinion about Greeks these times. A main reason for this is, what I would call broken trust. It has been presented as a fact in the media, that Greece has fooled Europe repeatedly with its statistics. Whether others have done that too, wether this itself is true or not, the German public has lost its trust and belief in a “self-healing” of Greece. So there is a strong thumping for control mechanisms. I don’t think we should ignore this need of the German public. There is no trust any more. So I would suggest, that you also consider a control mechanism. A strong financial control mechanism is the only way the German public will be willing to accept Eurobonds. The atomsphere in Europe is poisoned. We (Greeks) should consider that and show some understanding for the mistrust of the other side. It is not only being lied to again and again (and this includes the German politicians). It is also the the perceived chaos: lots of people not paying their taxes, not writing receipts etc. and we get sent the bill. Your president said, sorry” I do not have the strutures to collect taxes. I need a private company to do it”. – Are we talking about Africa? The word developing country is more used in connection with Greece. The German public will never accept Eurobonds. The risk is not only Greece, but all the other Club Med countries who do not have a history of solid finances. Before the idea of the Euro Greece paid 10-15% interest, and rightfully so.. Since the introduction of the Euro Germany had very little growth and no real salary increases. The capital export of about EUR 1.500 caused a tough time. It is only now as capital stays here and is withdrawn from other countries that we are experiencing a boom. The claim, that Germany benefited the most from the Euro is not correct for the time from 2000 to 2010. Maybe for some companies, but not for the people. but companies have no voting rights ;-). So first we do austerity measures to stay competitive, save money. Then our banks burn the money with silly investments and then we do not get the promised tax reduction and then we should take on debt for fiscally irresponsible countries with 3rd world like structrures for tax collection. All over Europe we finally have people protesting against this EUCCP/EUDSSR. Nigel Farage from Britain is becoming a superstar in OTHER countries on the web. In Finland, accordint to Juli polls, the anti EU/EURO party “Perussuomalaiset” (True Fins) is now the strongest party in Finland at 22% (up from 6% in Jan 2010 and 15% in Jan 2011). I tried to describe the mood of the “broader public” in Germany. I tried to suggest a compromise which considers the feelings of the people. I was talking about the people, who are reading the “Bild” newspaper, are listening (only) to the German talk-shows and listening only to economists like Sinn or Kerber. I was trying to take into account their mood and feelings about the situation. I was certainly not talking about facts and reality. I hope you don’t identify yourself with the above group. The truth in economist’s circles is much more complex. I will not present my views in this blog, I am here to learn from Prof. Varoufakis and ask him things. What disturbs me, as a non economist, is the chutzpa of those star-ecnomists, who each claim to be in posession of the truth, while contradicting one another. To me Prof. Varoufakis is a pleasant exception. I feel, I am learning something here. We could need some cool, mathematical reasoning in these issues. @Xeno: No i do not read Bild. However I am a big fan of Hankel & Sinn. They are both extremely bright and they say what they think. They even say that Mr. Schäuble has no clue about economics, which is true. You should watch Hankel “Es war einmal der Euro”. I think it is from 2007. It is amazing that everything he said would happen actually has. Extremely sharp for an 80 year old. Did you put Merkel on the mailing list? 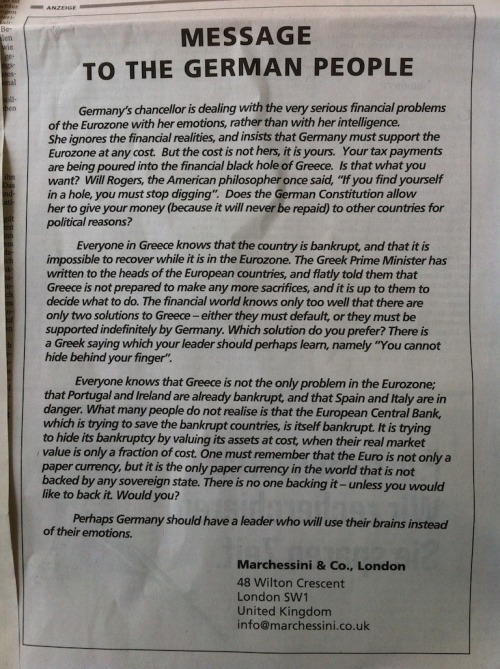 This Der Spiegel article proves that the Greek Crisis is used as a tool towards tighter EU governance. You are absolutely right. The horse has indeed already bolted a long time ago and mending the fence won’t help at this stage. The markets have already begun to react as you predicted with the spreads inching up again before the ink has even had time to dry on this new plan. For how much longer can it not only be believed but positively ordained that by pushing an economy deeper and deeper into recession through draconian austerity programs anyone is ever going to get paid back? It’s right to put the new deal in a wide European context, but I disagree with your statement that if it had been done a year and a half ago, it could have worked. You have rightly argued all along that Greece does not suffer only a liquidity crisis but a solvency crisis. It did so a year and a half ago, and it continues to do so. This deal helps finance the debt hump by improving the cash flow profile of Greece. It does little to address the solvency issue other than the trivial haircut some banks may – or may not – take. As I remarked before, let’s hope that the Greek political class doesn’t take this as an escape from the reforms it has so reluctantly agreed to. Dear Jerry, We do not disagree on this. My point was not that the current deal would have worked had it been implemented 18 months ago. What I said, or meant to say, is that it would have bought Europe more time, averting for a while contagion to Ireland et al. Even then, the crisis would have unfolded. As for Greece’s case, I too want to see no stone left unturned and no institution allowed to continue as is. It is just that I have no confidence in the direction of change that the current regime is moving towards. In other words, if I had 200Billion that I wanted to just donate to Greece, it wouldn’t change a single thing. You definitely missed my point and that’s not surprising. If Greece were to receive such a sum from me, not a loan, not a “bailout” but just as a gift, then, its financial indicators would be better that any other Euro country. Right? My point, would that save the euro? Would it alter the basics of the European financial crisis? Of course not. Italy was paying 200pts less 3 months ago. Nothing in its situation has changed negatively, yet it has become the new “target” by the markets. Figure it out. Why do you discuss a few basis points? Normal interest rates for countries like Greece are higher than 10%. The market just did not get that the last 10 years. Before the Euro was announces interest rates were as high as 15% in the club med countries. Given the lack of chance that the money will be paid back, rightfully so. The three steps that will not solve the problem. Unifying the banking system will cause the loss of sovereignty of Greece and all the The three steps that will not solve the problem. Unifying the banking system will cause the loss of sovereignty of Greece and all the smaller and weaker countries. Although the Germans probably will be against it, in reality if the banking system will be unified the Germans will dictate Europe. People of Europe want to be Europeans, but at the same time they don’t want to lose their identity. Germans will achieve what Hitler tried to do, but this time the other countries will offer it to them. Marshall Plan helped many European countries, but it is a form of soft colonization. When people didn’t have food maybe it was helpful, but now nobody needs a Marshal plan. Common bond policy could help. The problem of Greece is not that the Greeks are poor and need handouts; the problem is that the management of the countries’ affairs are in the hands of incompetent people for very long time. What the Greeks need to do is create a reservation and move all the political elite with their intellectual support and feed them for free with pies of their choice for life. for very long time. What the Greeks need to do is create a reservation and move all the political elite with their intellectual support and feed them for free with pies of their choice for life. 1) As for loosing the identity. It is true partially. The fact that Crete is incorporated to Greece or Chios, or Thessaly…., has not eliminated the identity of the locals, though a homogenization is happening in the big towns of Athens and Thessaloniki. Loosing identity is a voluntary choice, and it will happen to many greeks who are forced to go abroad to find a job. 2) For how long was Greece a colony of the US, soft or not? Until the fall of the iron curtain? Well, I prefer the soft colonization of the US to the colonization that would have happened had the civil war gone the other way. 3) I do not think that common bonds will work effectively if there is no coordination of the banking systems. I agree that part of what we need is a new political class, but mostly we need to change our personal attitude of “anything goes for me”, from evading taxes on our moonlighting jobs while drawing a civil service salary, to refusing to bribe tax officials even when they demand it, etc. etc. Yanis, check the dates of the next French and German elections, they mark the horizon of the kicking the can exercise, they are too far away, don’t be emotional about this. Jerry, an internal devaluation of the necessary 30% has not, to my knowledge, happened anywhere in peacetime. The question is whether Greece is still primitive enough to sustain it. The next federal elections in Germany will end the pro Europe & pro multicultural era. You will see the two Euro and Islam sceptic parties gain momentum over the next state elections already. Looks like not only we Germans are fed up with paying for other irrespnsible countries. Actually we have to thank the Greeks. Without you the current anti EU movement would not be possible. Come on, these malakes have made a caricature of Greece for their own political stance (of Europhobia). The problem is that too many British idiots buy such toiletpaper and don’t use it appropriately. In the UK: “Petition to leave the EU” started by Daily Express. The UK government has pledged to consider any public campaign endorsed by 100.000 signatures. This petition had 40.000 yesterday and is adding 1.000 per hour at the moment. Aha. Do you have the same view of the Troika “rescue plans” for the Greek economy? Sorry, but in my field of work you do not set out the big picture and then fill in the details later: that is what politicians and other criminals do. Serious researchers try to integrate macro and micro to get some picture of reality. Then you have a very inefficient way of working. Working without hypohesis is like starting to dirve without knowing what the destination is. “Regarding Paul Hannon’s Agenda item of July 19, “Even Getting It Right Seems to Be Wrong,” and other recent euro-crisis coverage, it seems the debate in Europe still revolves around supposedly frugal Germans and “profligate” Greeks. But a vacation to Greece years ago left me thinking there’s more to it than that. During a visit to farming areas around Sparti in the Peloponnese, a Greek friend pointed out some olive trees that were three years old and that he expected to bear fruit within a year or two. How could that be, I responded, as I had been taught that olive trees could take decades to bear fruit. My friend pointed to some flexible plastic hose near the trees and told me that this was a German-made irrigation system that sent measured amounts of water to the olive trees, allowing them to bear fruit so quickly. The next day, on the trip from Sparti back to Athens, I noticed that we rode in a German-made bus. From the Athens bus station, we rode to our hotel in a German-made taxi. Our Athens hotel room included a German-made television and a German-made toilet. The talk of frugal Germans and profligate Greeks is too simplistic. Every loan involves a borrower and a lender. Perhaps a more accurate view of the euro crisis would be that the Germans lent money to Greece (and to other countries in Europe) to keep German factories humming. Now there must be a day of reckoning for both Greeks and Germans. The Greeks are facing up to their part of this disaster, but it seems the Germans are still in denial. All these products might bare German brands, but most are not made in Germany. So “the Germans” have little to do with it. In case you disagree with this logic: the goods were delivered and paid (most of the time). Noone forced Greek customers to buy German products, so why force German citizens to pay for Greek profligacy & inability to collect taxes? If Germany was a company the thinking would be like this: Greece accounts for 0,6% of German exports. Why dump several months of (German tax) revenues into a C customer that has no growth and is unlikely to pay his bills? Maybe the most Germans are in denial, but the industrialist are almost printing money, because of the Greek problem the Euro is down, therefore the Germans have a feast because they sell and sell and sell and the southern Europe is crying and crying and crying. The Germans never had it better. For Europe it will be preferable that Germans return to their marks, this way their currency will go higher and give the rest of the Europe a time to breath. Sometimes it comes to my mind, that the whole thing is engineered by Germans in order to transfer the loans by Greeks for German products to be transferred to German folk through taxes.